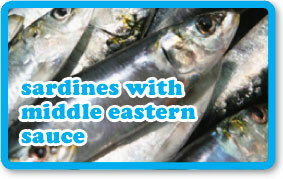 This is a middle eastern inspired way to eat delicious sardines. I bought a bagfull at the Sydney Markets today and wanted to use them right away. Buy them fresh and gut and fillet them yourself, it’s the easiest thing to do in the world. If you’re not up for that then buy them pre-filleted, but be sure to use fresh, not tinned. They’re good hot or cold, so if you want a stress free dinner party then prepeare in advance and serve at room temperature. *Za’atar is an arabic spice & herb mix typically a combination of thyme, sesame seeds, cumin, oregano and fennel. You can buy it at middle eastern stores or sometimes under ‘gourmet’ at supermarkets. You could always make your own if you have all the ingredients. Heat the oil in a pan over a medium heat and gently fry the onions for 3-4 minutes with a little salt until they brown. Add the garlic and fry for 1 minute more. Add the cumin and za’atar (if using) and stir briefly, then add the tomatoes, breaking them up on the side of the pan with a wooden spoon. Fill your tomato tin with water and add this to the mix, stir well and bring to a simmer, reduce the heat and simmer gently for 20-30 minutes. Remove from the heat and stir in the olives, parsley and mint. Add more salt if needed and plenty of black pepper. Squeeze over the lemon juice and stir well. Heat another pan with a little olive oil until hot then add some sardine fillets and fry for about 30 seconds on each side. Make a single layer of sardines on a serving plate then spoon over the tomato sauce evenly. Sprinkle with more parlsey before serving. Serve with fresh crusty bread to mop up the sauce.